One word…soup but what a world of variety and comfort! Here at The Pantry “soup” has the status of an art form. I love creating special pots of soup and sharing the enjoyment with others. On Saturdays customers can often sample some of our delicious soup recipes. Although I do make soups totally from scratch, base soup mixes can be so handy when we are busy. One of the soups we have sampled is Biaty Barszcz, a Polish white borscht. It is a traditional Easter soup made with a sour cream base and flavoured with a little bit of horseradish. We have been carrying Winiary brand white borscht soup mix. I don’t think traditionally the soup contains cabbage but I wanted to give the soup a bit more body. I chopped up about a third of a large cabbage and sauteed that in a bit of olive oil. After mixing two packages of the Winiary soup case with the required amount of water, I added the sauteed cabbage and 2 Hungarian Debreszeni sausages chopped up. That filled my slow cooker which I let simmer overnight so the soup would be ready to share with our customers this morning. A few weeks ago I made Dutch Zuurkool Stamppot. 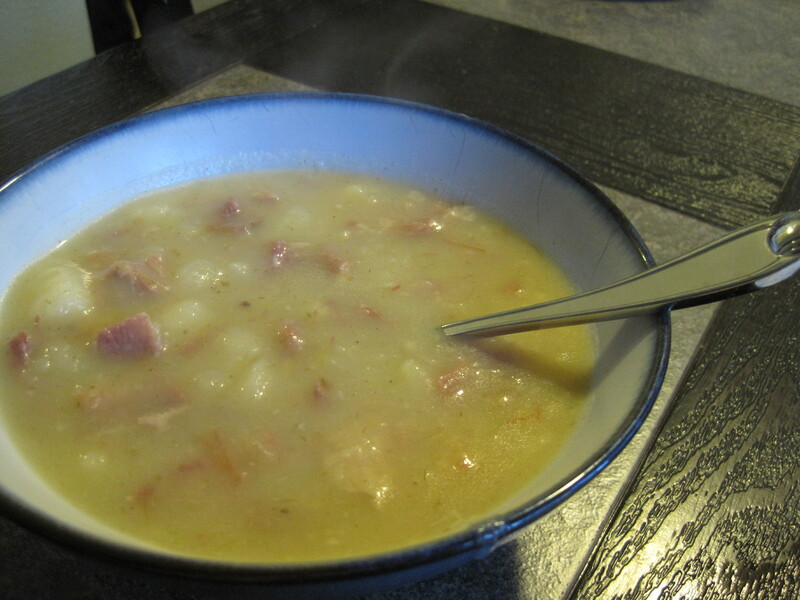 The Dutch love mashed potato dishes and this is one of their many variations of Stamppot. Very simply, chopped sourcrout is mixed through mash potatoes although I added Silvo Zuurkool kruiden: an herb mix that elevates the flavour of the resulting dish. Usually I will serve a dish like this with Dutch Gelderse Rookworst…smoked sausage prepared with a recipe that hails from the Dutch province of Gelderland. 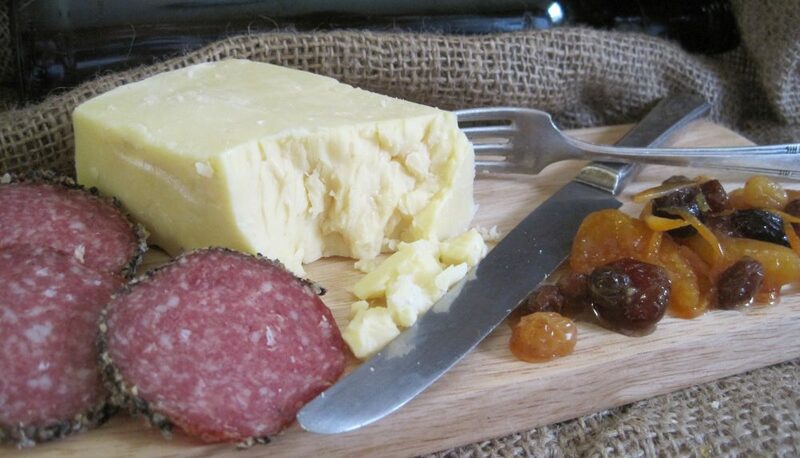 But this time I served it with the same Hungarian Debreszeni sausage I used in the soup today. 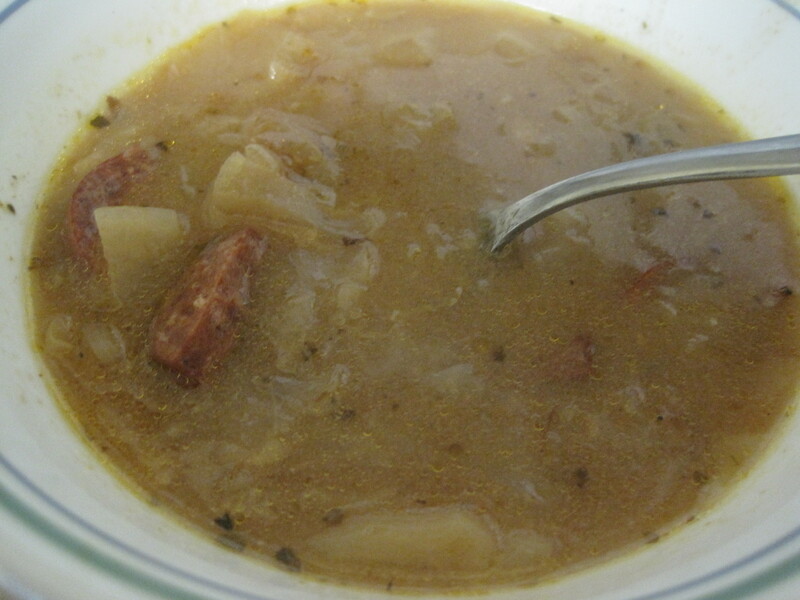 The slightly sour taste of the soup and the Stamppot pairs wonderfully with the Hungarian Debreszeni sausage. When I was visiting my son and daughter-in-law in February we cooked up a family favourite: Potato Leek soup. 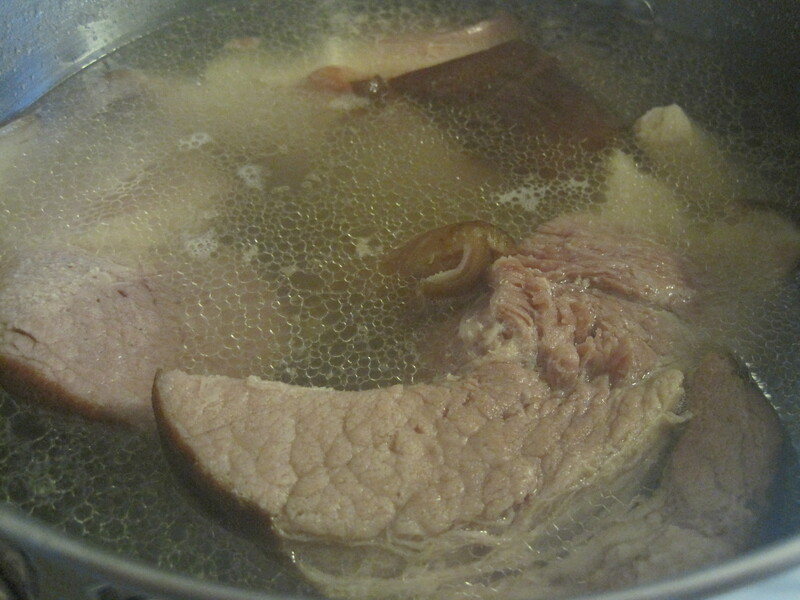 The secret to this soup is simmering smoked pork hocks all day until the meat falls off the bones and you have a thick gelatinous broth. At home I have the wonderful Wagener Meats smoked pork hocks here at The Pantry. Those aren’t available in Washington State. In fact, I couldn’t find any pork hocks in the store. What I did find were smoked pork shoulders. They were called picnic hams…nothing like the sweet brine picnic pork shoulders I get here in Ontario…but prepared much the same as our pork hocks. Some recipes for Potato Leek call for rich cream. Cream, however, limits the keeping life of the soup so if I am making a very large batch I prefer using a combination of Knorr Cream of Leek sou p and Knorr Cream of Potato. I couldn’t find those products in my daughter-in-law’s grocery store either so I was back to improvising. In the end, I used a couple of packages of alfredo sauce mix to create the creamy taste we are used to. What couldn’t be substituted though was several teaspoons of Verstegen Gehakt Kruiden. Fortunately, this “secret ingredient” which is actually intended for making Dutch meatballs was not forgotten in Ontario although we actually found it in a Dutch bakery the next day. To me Verstegen’s special combination of coriander, pepper, ginger, mace, nutmeg, cardemon, chillies and marjoram give the soup a little something special. 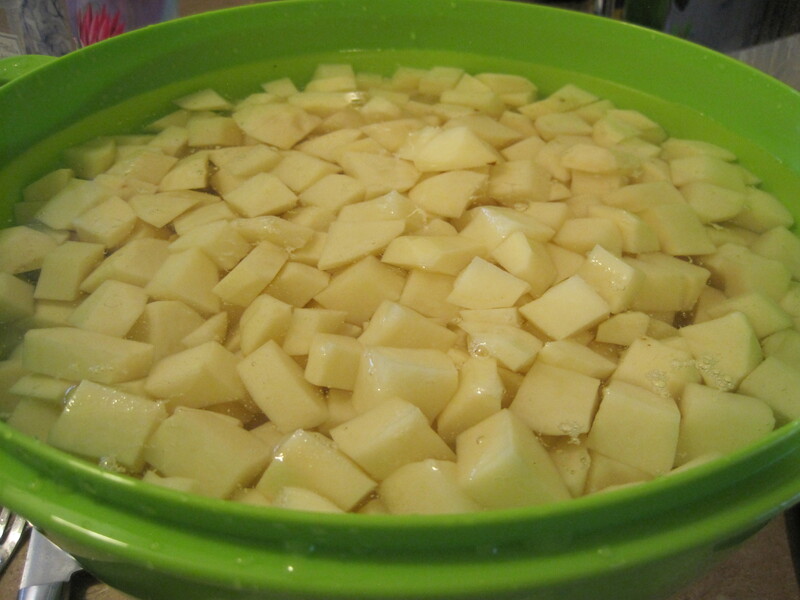 It took a while to peel and cube all the potatoes but what a nice way to spend an hour chatting while you work. 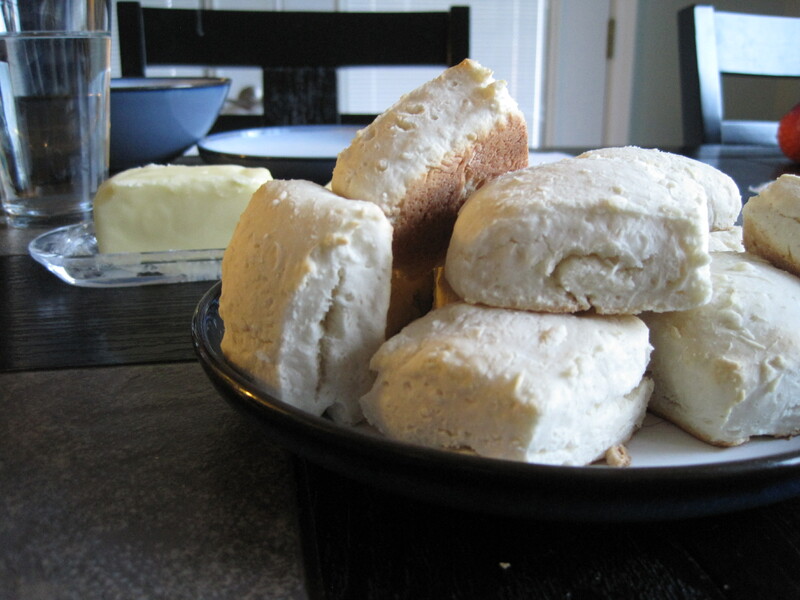 We enjoyed the resulting soup for supper that night with light biscuits. We also were able to freeze meal size containers to be enjoyed by our western family long after I went home. It will also bring back the memory of a special day of cooking together. I know I won’t be able to make another pot of Potato Leek Soup without it bringing back that memory! The Year of the Kitc… on Bring Home the Colour!